Someone mentioned last week that I didn't publish any visitor infomation to "The Colonel's Eagle" for last week. This is basically because I didn't intend it to be a regular feature, but here it goes for this weeks visitors. 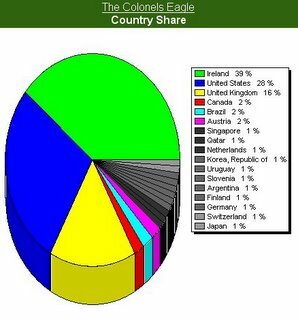 As you can see there's been some hits from such far off lands as Finland, Qatar, Singapore, Korea (South) and several hits from a number of South American countries. Sith Apologist demanded browser details, as he "did his bit" for Firefox. I think he certainy did as Firefox has risen from 5% to 28.57% of the type of browser that people used to access this site last week. Various incarnations of IE still naturally have the lions share at 63.26% the remainder is divided between Netscape and Safari. Mozilla and Opera have vanished. Ok, this is freaky ... it seems that when my connection dies for a weekend, no-one but the Colonel posts! That's 'cos most people read and post during 9-5 working hours and don't work at the weekend. I've just ran a the browser share query and Opera has indeed increased from 0% to 1.2% today. Excellent, it's all falling into place.